Enjoy dessert and coffee hosted by Pastor Chad and his wife, Rhonda in their home. 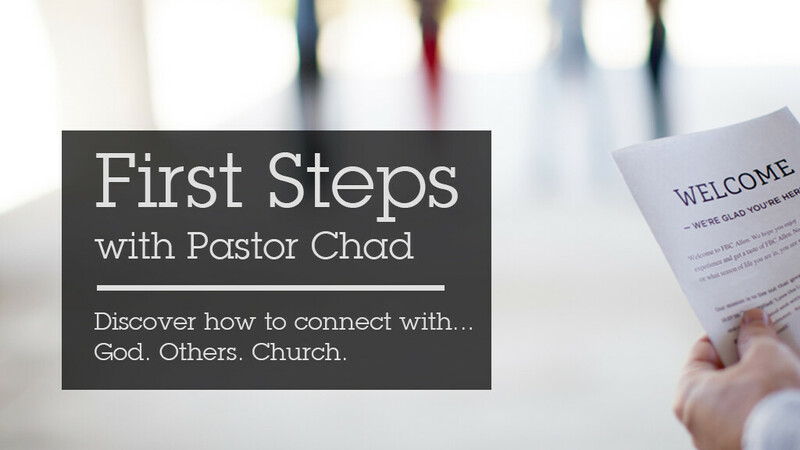 First Steps With Pastor Chad is a great opportunity to hear personally from our Senior Pastor, Chad Selph about how to specifically connect at First Baptist Church Allen in the way that’s most important to you. Pastor Chad will walk through 'on ramps' of connection with God, connection with others, and connection with service opportunities. He’ll share his story, the vision for the things we’re passionate about at FBC Allen, and he’ll point you towards the next steps on your own journey. At the end of the class, you will have an opportunity to become a church member.